Johnny Cash had the strong and steady voice of a train running along the tracks – a consummate cowboy who’s as remembered for his life of contradictions as he is for the mark he made on music. He was both a rebel and a romantic, a sinner and a believer, a cowboy and an artist. 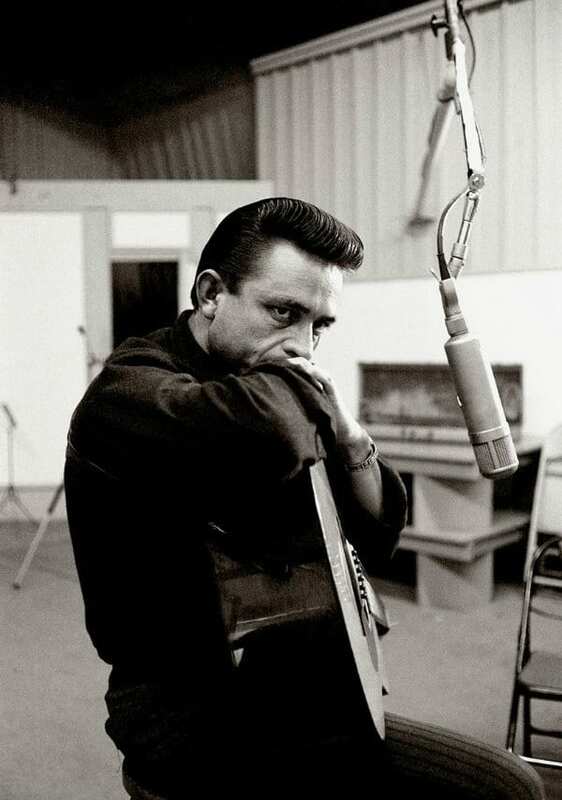 There’s still so much about the Man in Black that even the biggest Johnny Cash fan wouldn’t know, like why he only wore black or the secret to how he wrote one of his best songs. So, put on your finest cowboy boots and ten gallon hat while we look back on the larger than life stories of the legend that is Johnny Cash. Very few people are born already a star, but Johnny Cash wasn’t even born with that name. 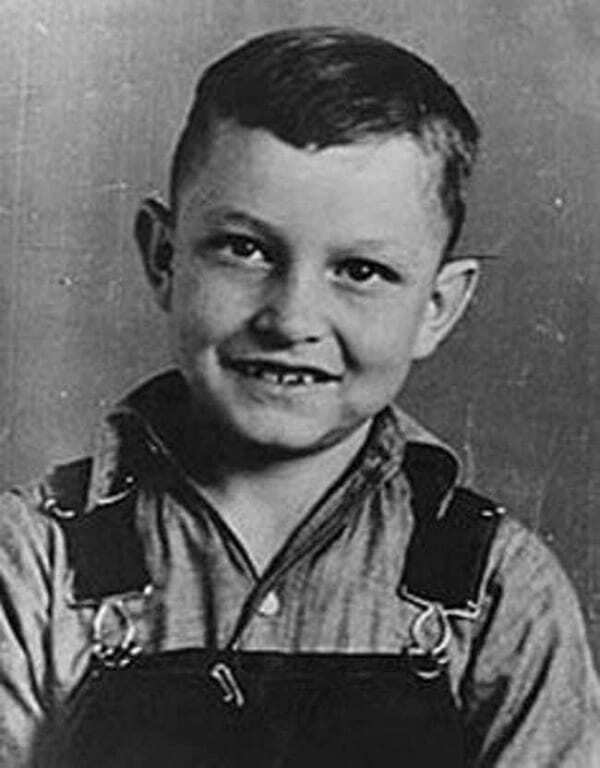 While you may not think of Johnny Cash as a good ol’ down home country boy, Cash came from humble beginnings. Born in Kingsland, Arkansas to Ray Cash and Carrie Rivers Cash, his parents couldn’t decide on a name for their new baby boy. After a bit of debate the couple settled on J. R. Cash. While a name of initials sounds strange nowadays, it was a fairly common practice in the Depression Era south. J.R. Cash was known to everyone to be a friendly, wise-cracking youngster, but his fate was tied to another’s, and that would soon change. The fourth of seven kids, Cash grew up picking cotton on the family farm and above all, idolizing his big brother Jack. 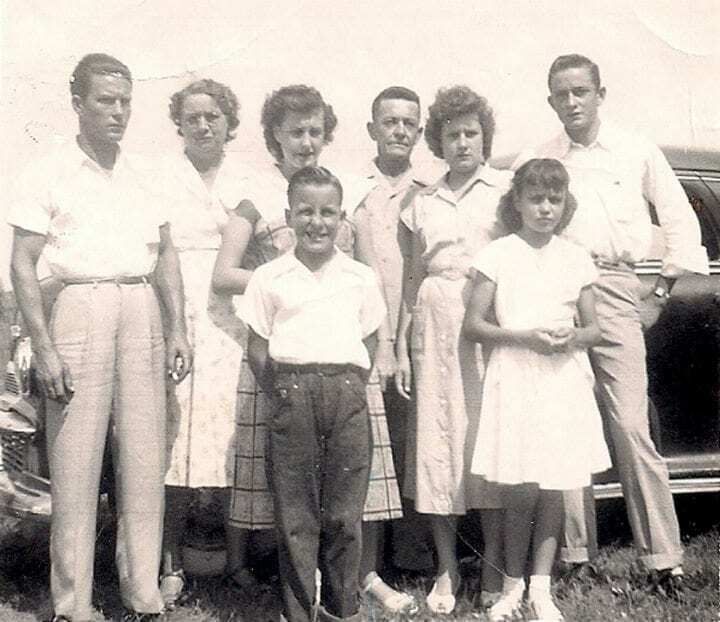 The Cash family sang work songs and folk songs in the field, and gospel around the dinner table. While he didn’t have a guitar of his own, his mother taught him to play. Showing real talent, Cash sang at school, church and even won the grand prize of $5 singing in a talent show (sure, it wouldn’t buy much these days, but that was a lot for the 1940s!). But that would change, when a family tragedy would change his outlook on life. Cash would later say he woke up with a feeling of dread on a fateful day in May, 1944. Despite his mother’s suggestion that the boys go fishing, Jack went to work and suffered a freak accident while using a table saw. Before he died, Jack spoke to little J. R. of heaven and angels, forming Cash’s attitude toward spirituality. Cash became less the silly boy he’d always been, but out of grief came the inspiration to start writing. For the rest of his life he often asked himself “What would Jack do?” when faced with tough decision, of which there would be many to come. So, what would Jack have done? Teenaged J.R. decides to enlist in the U.S. Air Force on July 7, 1950. The enlisting officer told him he couldn’t enlist a man with initials instead of a name, and finally, J.R. becomes John R. Cash. But, even Jack couldn’t have seen this coming. Before he’s deployed, he meets Vivian Liberto at a roller skating rink, and the two are instantly smitten. It was clear, this was love at first sight. Ignoring his looming departure, they date for a whirlwind three weeks before Cash is deployed to Germany – but would they stay together? Staff Sergeant of the United States Air Force John R. Cash, served in Landsberg, Germany as a Morse code operator intercepting and translating Soviet Army transmissions. Imagine translating Russian Morse code – pretty impressive! But before he would make history as a musician, he made history in a rather surprising way. In the course of translating Soviet Morse code, Cash came upon a message that changed the course of history worldwide. Johnny Cash was the first American to learn of Stalin’s death – even before President Eisenhower! But for Cash, what he remembers most of his time in the army would be something else entirely. It was in Germany that Johnny Cash bought his first ever guitar, for the equivalent of roughly $5. 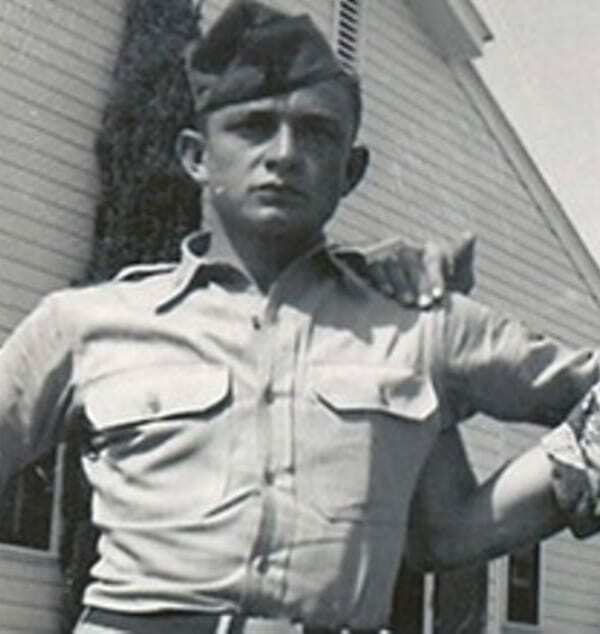 Guitar in hand, Cash musically charmed his fellow servicemen. Turns out that $5 he won as a kid would come in handy! 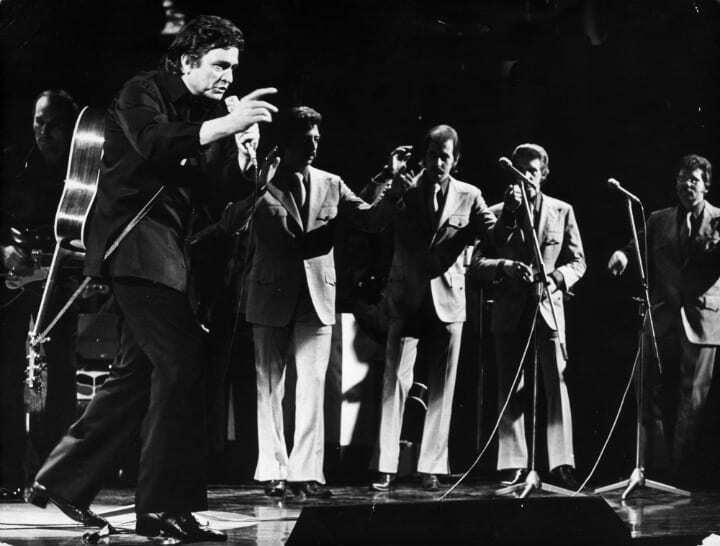 In Germany, Cash formed his first band with a few other men in arms – the Landsberg Barbarians. He even began writing some of his biggest hits while serving, like an early version of “Folsom Prison Blues.” You would think this would be the start of his music career, but he’d take yet another detour on his road to becoming music legend Johnny Cash. Three years of military service wasn’t enough to distract Cash from his back-home sweetheart, Vivian. They’d written hundreds of love letters to each other all throughout. One month after being honorably discharged, they’d marry and soon after they had their first daughter Rosanne. To support his young family, Johnny Cash worked at an appliance store. But he was clearly destined for greater things. On his short-lived career he said, “I was the worst salesman in the world.” While that may have been true of homegoods, he would go on to sell something some would argue is even tougher – a brand new sound. After moving his family to Memphis, Tennessee, where his brother Ray worked, Cash finally returned to his musical roots. 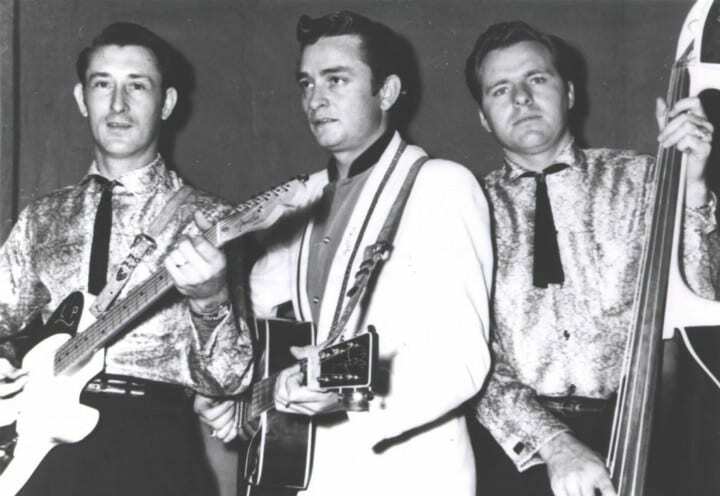 Ray played with guitarist Luther Perkins and bassist Marshall Grant, otherwise known as the Tennessee Two, and introduced Johnny Cash. It wasn’t long before he left his day-job behind. Johnny Cash and the Tennessee Two started playing together and quickly realized they had something more together than just a good time. They performed for Sam Phillips of Sun Records and after a few tries – they won him over. Johnny Cash and the Tennessee Two were well on their way to taking the music industry by storm. For their first performance, the trio wanted matching outfits, but the only thing they all had was a black shirt – and so The Man in Black was born. The Man in Black became a large part of the legend of Johnny Cash, but he wasn’t as serious as his all black wardrobe made him seem. While on the road, Cash and his bandmates once let 100 feathery flapping baby chicks loose on each floor of a five-floor hotel where they were staying. Imagine the chaos! Better yet, those baby chicks wouldn’t be the last time Cash played a chicken-based prank. Have you heard about that time when Johnny Cash, the Man in Black met the Man in the Bedazzled Jumpsuit? 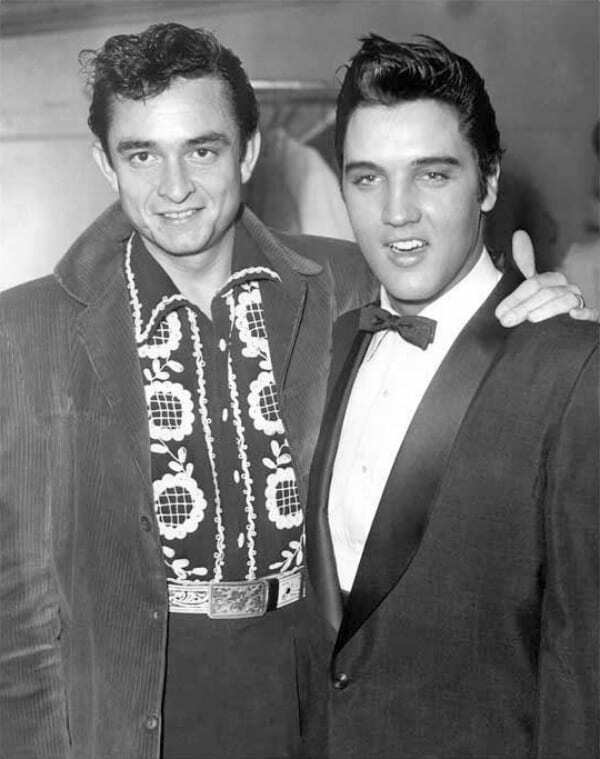 Johnny Cash, King of Country and Elvis Presley, King of Rock n’ Roll together and crooning in one room? Yes please. 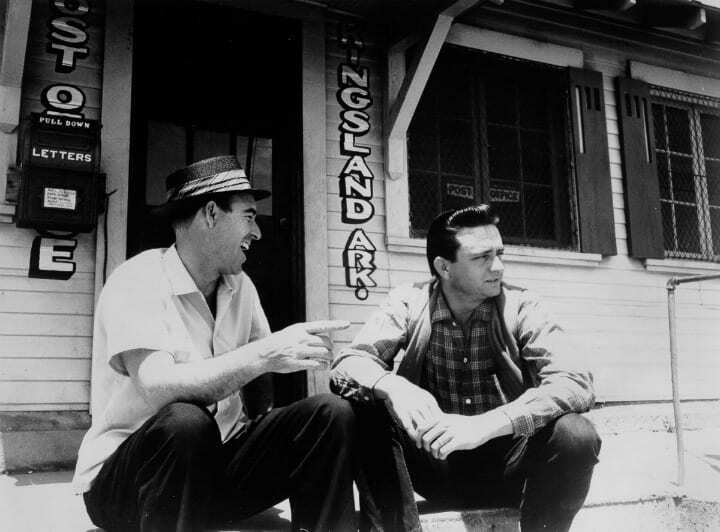 In 1956 Elvis dropped in on Sam Phillips of Sun Records, where Cash was working in the studio with Carl Perkins and Jerry Lee Lewis. The four had an off-the-cuff jam session, later released under the name the Million Dollar Quartet. The two would stay friends for years and Cash would eventually take a page from Elvis’ playbook, leading him down a surprising career path. One of the perks of being famous? Famous friends. Cash didn’t just count Elvis as his only celeb pal, he had close associations with lots of the biggest country and rock stars of the day, including the highly respected Carter Family. 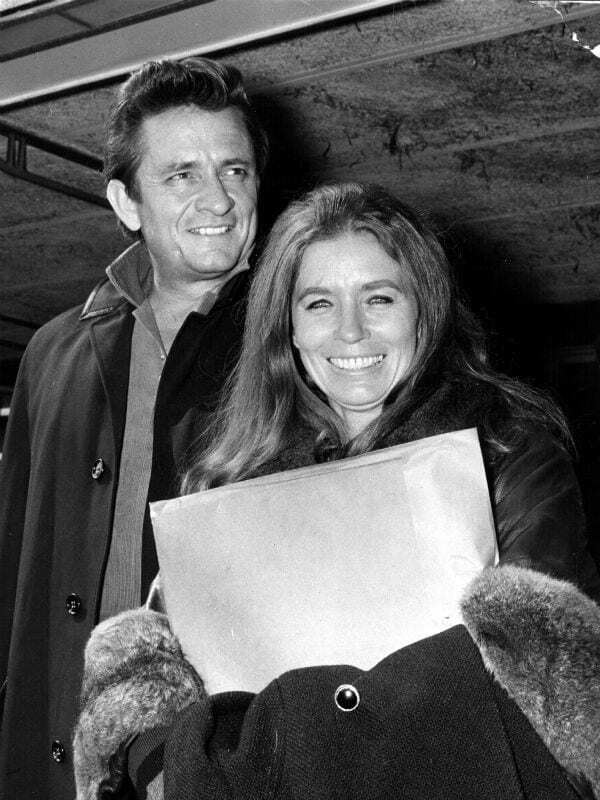 Johnny Cash first toured with the Carter Family in the early 60s, and it was then he met the great love of his life, June Carter. 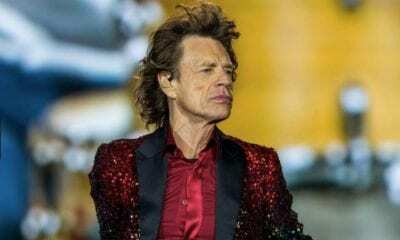 But before they could spark a love story for the ages, there was still the issue of his marriage to Vivian Liberto, and June Carter’s marriage to her second husband Edwin Nix. Would true love conquer all? What’s a gal to do, when she’s so hung up on a guy, she’s all but ready to sing it from the rooftops? In the case of June Carter, write it down with the help of singer/songwriter Merle Kilgore, and give it to your sister Anita to record. 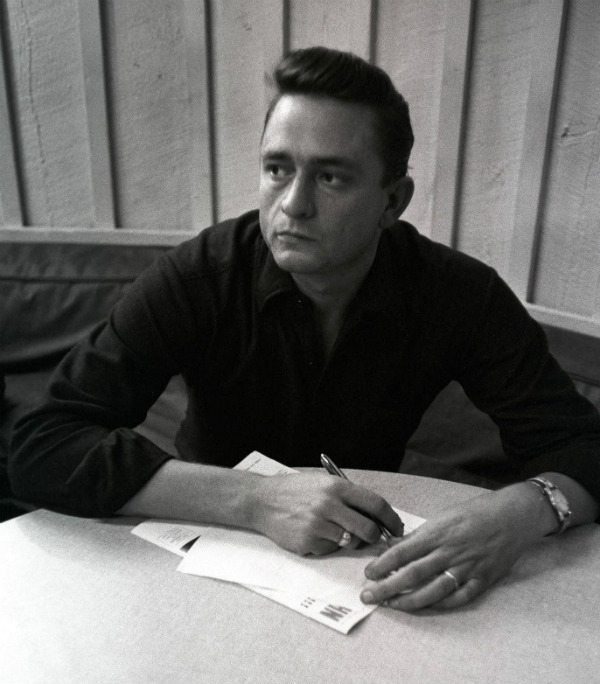 That’s right y’all, one of Cash’s most recognized hits wasn’t written by him – but it was written about him. 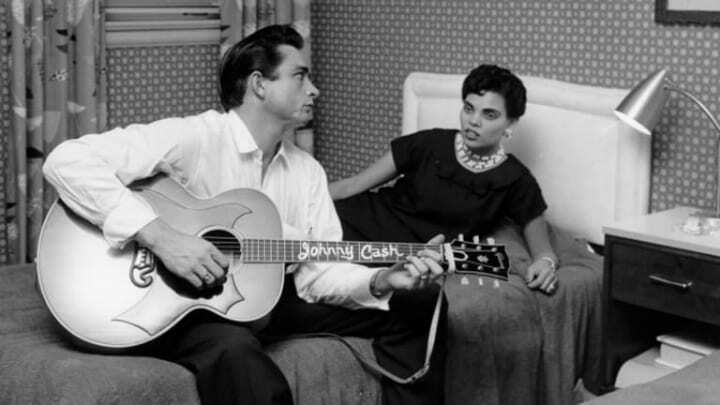 Cash heard Anita’s rendition of Ring of Fire, and had a dream of a re-orchestrated version including mariachi style horns. But what happens when you dream a song, only to wake up and the words are gone? 13. 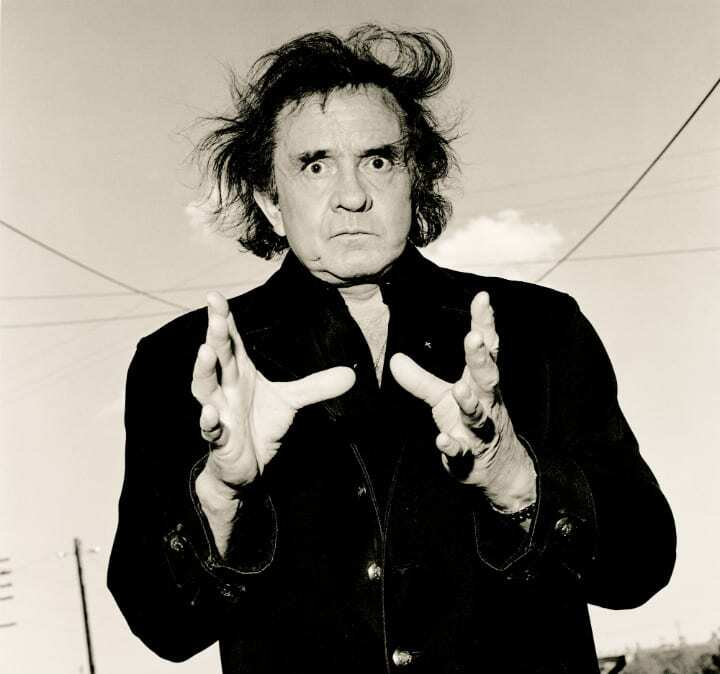 Johnny Cash, Johnny Horton, and Hypnosis? 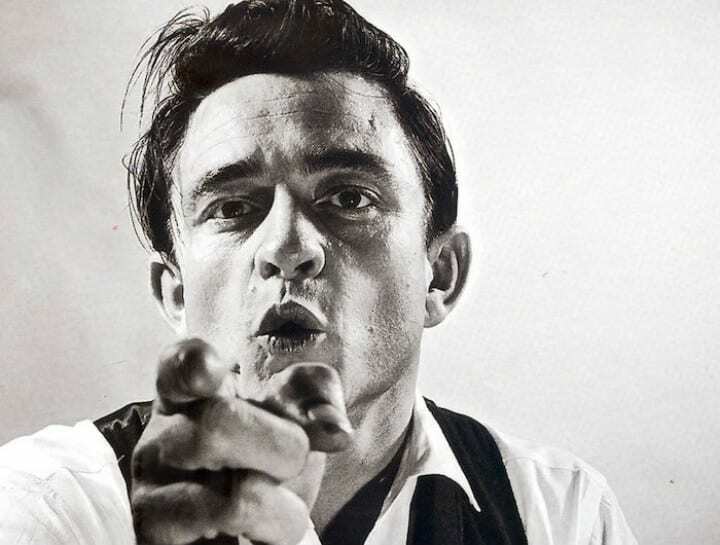 Johnny Cash’s cover of Ring of Fire became a crossover hit, reaching the top of both the country and pop music charts. To this day, the song stands as a testament to the love between Carter and Cash. But there was a time when Cash dreamt up an entire song, only to forget all the lyrics when he woke up. So what about that song he’d left in dreamland? Luckily, Cash had a famous friend with an interest in all things spiritual and supernatural. He called on his friend and fellow country musician Johnny Horton to hypnotize him, opening his mind to the forgotten song. It worked! The sleeper song became the hit I’d Still Be There. But life wasn’t always a dream for Cash. 14. Flower Picking, a Criminal Offense? 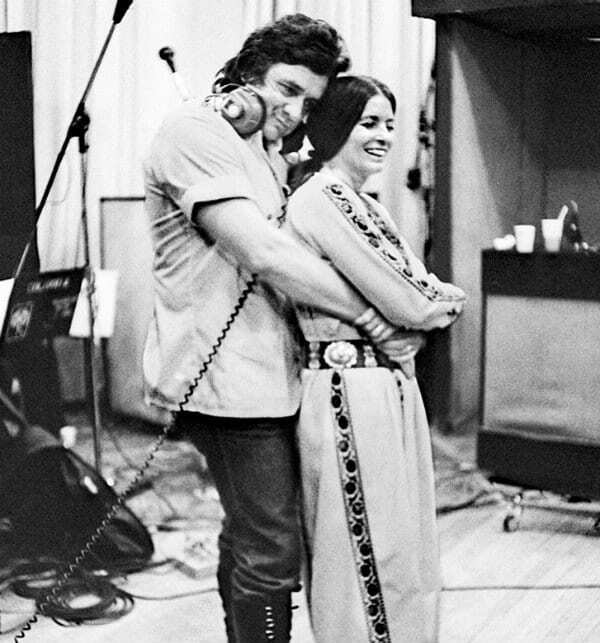 Can you really blame June Carter for falling for Johnny Cash? The bad boy persona can be hard to resist. He may have been a romantic at heart, but Cash’s famous rough and tough cowboy swagger wasn’t just an act. Johnny Cash suffered from substance abuse and alcohol addiction, but even throughout his lows, he continued to charm the nation and put out hit songs. 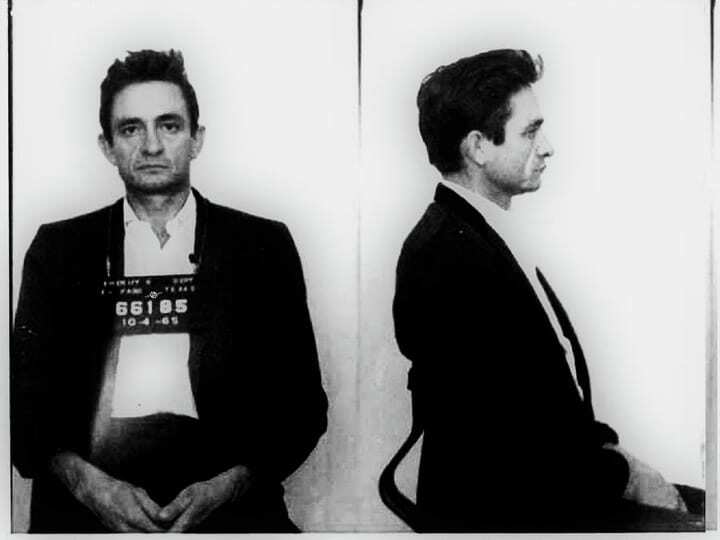 Late one night in 1965, country music superstar Johnny Cash was arrested by local Mississippi police for picking flowers on private property (eventually racking up seven arrests in total). The public didn’t care though, and the image of Johnny Cash the Outlaw only increased his appeal. So, you thought the flower picking incident was bad? One time, Johnny Cash and his camper, named after the great outlaw Jesse James, went on a bender in the Los Padres National Forest, and when two outlaws get together, the trouble doubles. Jesse James caught fire, which spread to a full-blown forest fire. The blaze drove away all but nine endangered condors and caused some serious damage. Cash became the first person sued by the US government for starting a forest fire. In court, when asked why he did it Cash responded, “I didn’t do it, my truck did, and it’s dead, so you can’t question it.” Unfortunately, his run of bad luck wasn’t over just yet. 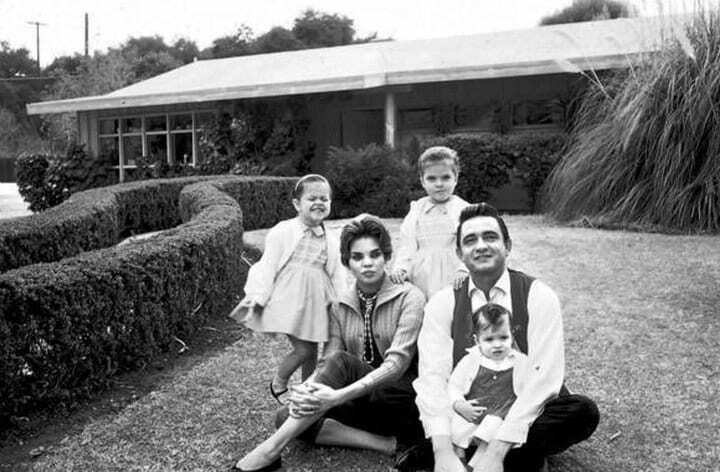 After months away on the road, Johnny Cash finally came back home to Vivian and their four daughters. They say distance makes the heart grow fonder, but in this case the opposite was true. Cash had made a tough decision — he wanted a divorce. However, from the lowest lows can come the highest highs. 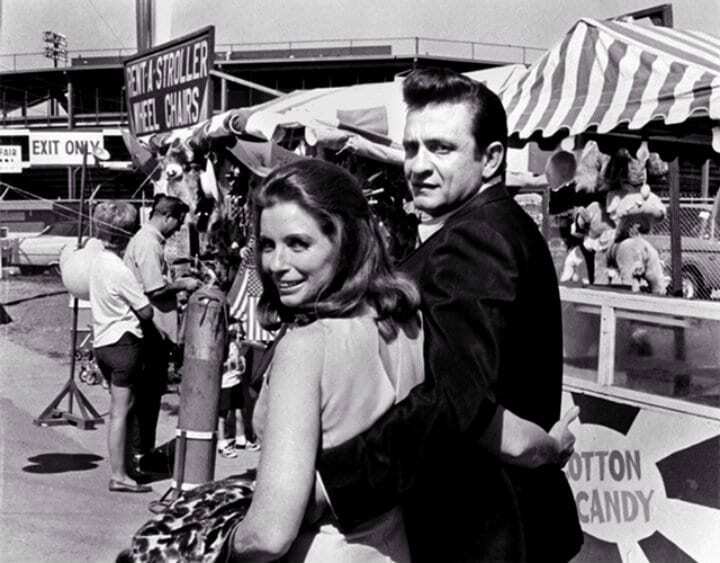 It had been a few years since Johnny Cash had met June Carter, and their chemistry wasn’t limited to the studio. After their respective divorces, the two were free to publicly pursue a relationship. After all that pining, what would happen when at last, they got the chance to be together? When they had first locked eyes backstage at the Grand Ol’ Opry in 1956, it was like a bolt of lightning had hit them both. 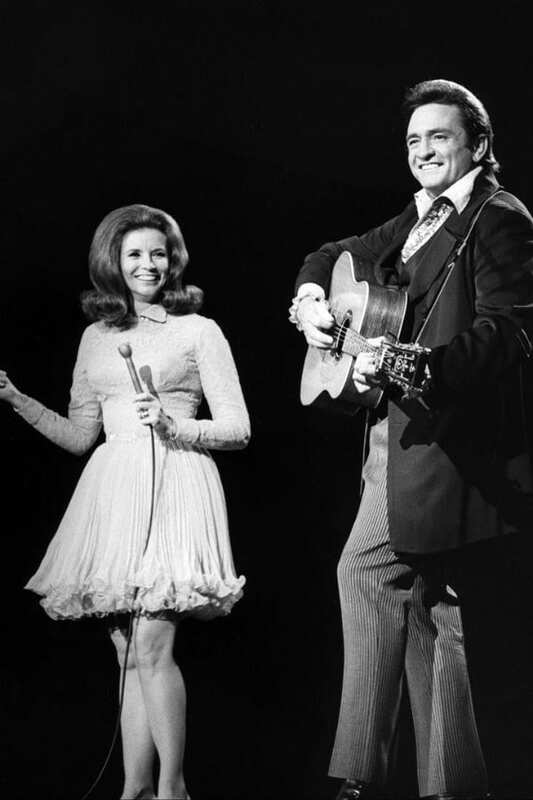 Cash and Carter, Johnny and June, sure, they were wildly successful on their own, but together, they would make musical magic. More than ten years after they had first met, Johnny and June brought their love out in the open, and it only added to their public charm. So you’d think that when they would perform a duet, it would be a love song, right? Turns out, their chemistry was so great, that even a cover of Bob Dylan’s It Ain’t Me Babe felt like playful banter between lovers. By now, there’s Johnny Cash the Romantic, Johnny Cash the Outlaw, but still there was more to him than most people know – like Johnny Cash the Native American Rights Activist. His record label would warn him his idea was “too radical for the public,” but he wasn’t deterred. In 1964 following the success of I Walk The Line, Cash put out an album titled Bitter Tears: Ballads of the American Indian. The songs were written to draw attention to the plight of Native Americans. To thank him for his efforts, Cash was inducted into the Seneca Nation’s Turtle Clan in 1966. Up next, a different sort of radicality, Johnny Cash the Believer. Life is a wild ride, and Cash would go through another low that would test the limits of his strength. Coming off another bender, Cash decided that something had to give, and he needed to do something about it, he just wasn’t sure what. 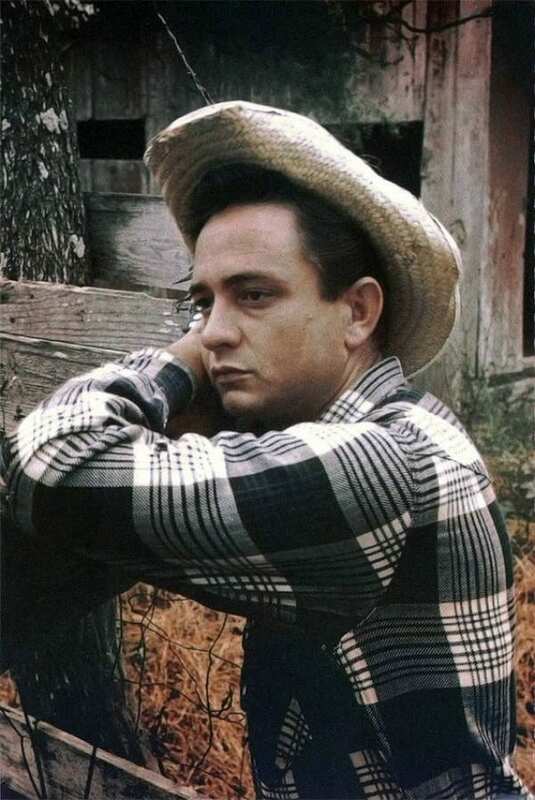 Johnny Cash was feeling tired, tired of the fame, tired of fighting his addictions, and just plain tired. He entered a cave, passing out on the floor for a long hazy night. In a delirium inside he felt God’s presence and emerged a changed man. Following his rebirth in the cave, his faith would help him see his future clearer than ever before. A year had passed since Cash had his epiphany in the cave, and while he’d known he loved June from the very first moment he saw her, he was more determined than ever to make their love official, but how would he do it? After more than 30 (!) unanswered proposals, Cash couldn’t do something as simple as getting down on one knee. 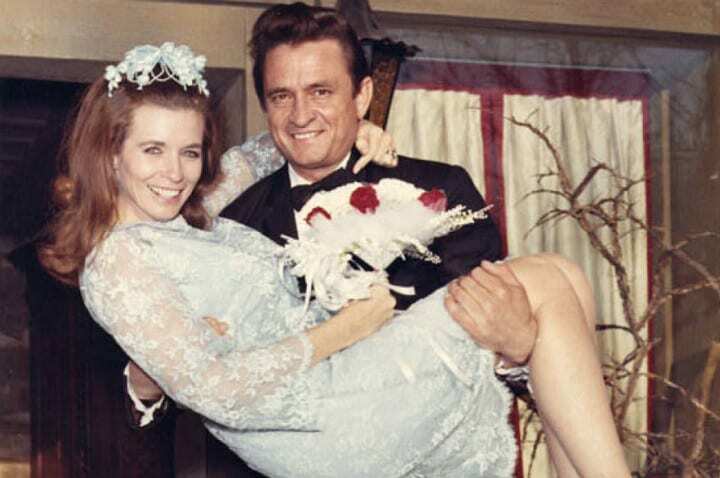 While on stage at the London Gardens in Ontario, right after finishing a duet, Cash turned to June and asked her — in front of over 7,000 people — to marry him. June tried to brush it off and just keep singing, but Cash wouldn’t sing until finally June said yes! But that wasn’t it for the two lovebirds. Just as everything in his life truly began to come together, Johnny Cash decided to shake things up a little. Taking a page from his friend Elvis’ book, crossing over into TV and movies. 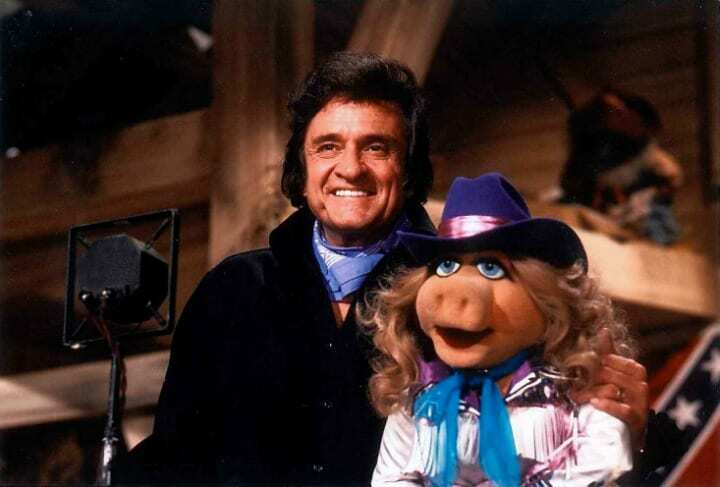 Cash as a silver screen cowboy isn’t so hard to imagine, but what about Johnny Cash the late-night host? His most notable TV gig was as host of The Johnny Cash Show, which ran from 1969 to 1971. Exciting guest stars to appear on his show included the likes of Bob Dylan, Joni Mitchell, and Louis Armstrong. 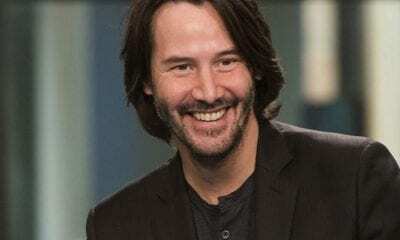 He would also go on to guest star on some other shows, like the time he played himself alongside everyone’s favorite Muppets on Sesame Street. But it wasn’t all fun and games after that. 22. A Boy Named Sue? Sesame Street wouldn’t be The Man in Black’s only kid friendly collaboration. Teaming up with humorous poet Shel Silverstein, writer of the delightfully ridiculous A Boy Named Sue, Johnny Cash was able to show a lighter side to his rugged persona. 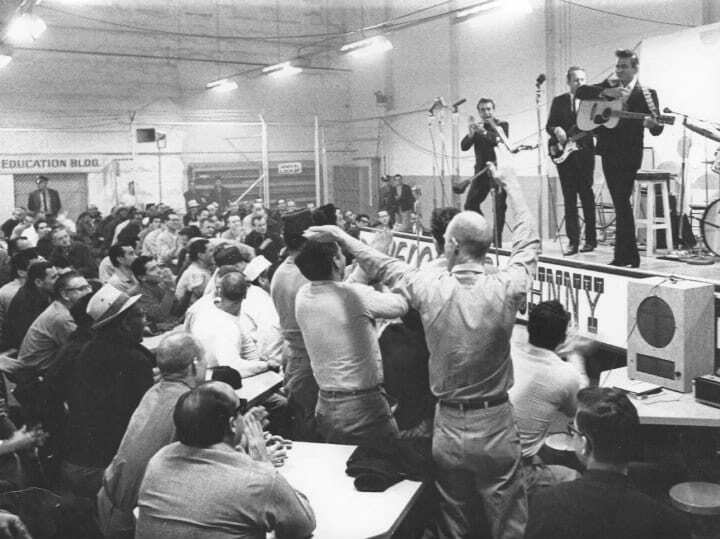 The song, about a boy named Sue confronting his father for giving him an awful name, was most famously performed and recorded live at the San Quentin State Prison. The live version became Cash’s biggest hit on the Billboard Hot 100, spending three weeks at No. 2. Seems unexpected that a bunch of inmates would help make a musical children’s poem such a hit, but they’d play an even bigger role in Cash’s career success. 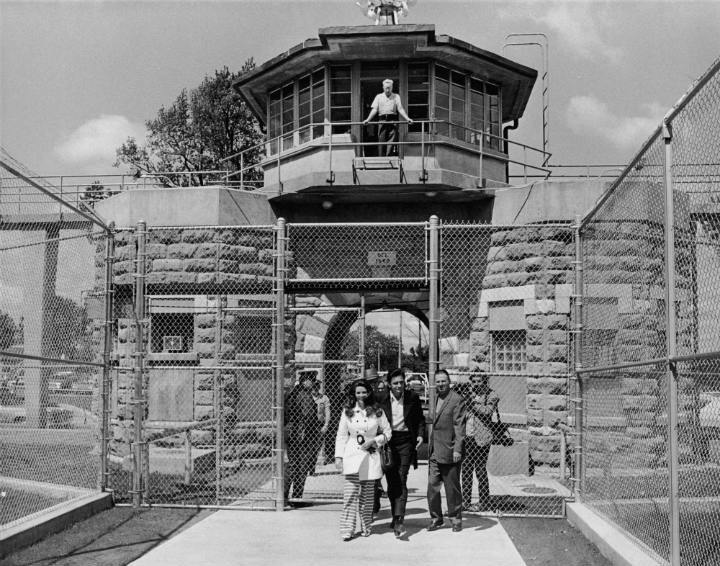 Despite his image as a rebel and outlaw, and his handful of arrests (not all of which were as innocuous as late-night flower picking), Cash never actually spent more than a few nights in prison — as an inmate that is. 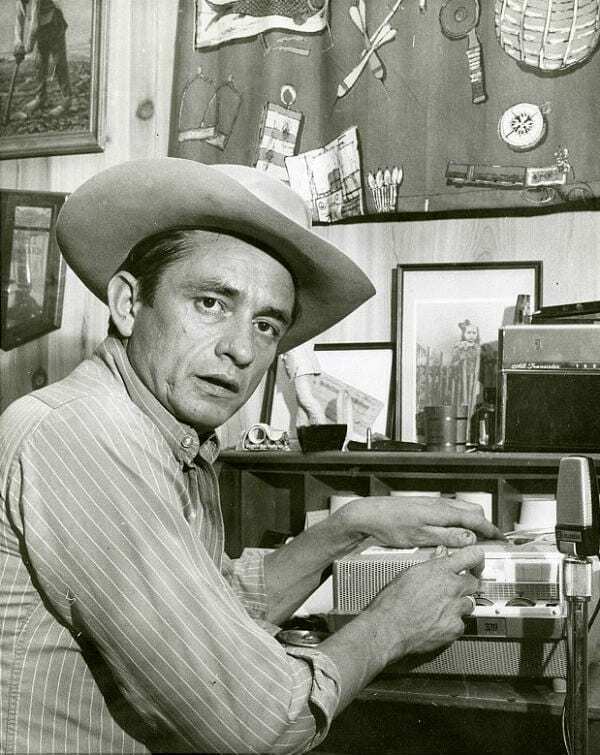 Following all of his immense success in the 60s – 70s, Cash’s records started decelerating in popularity. 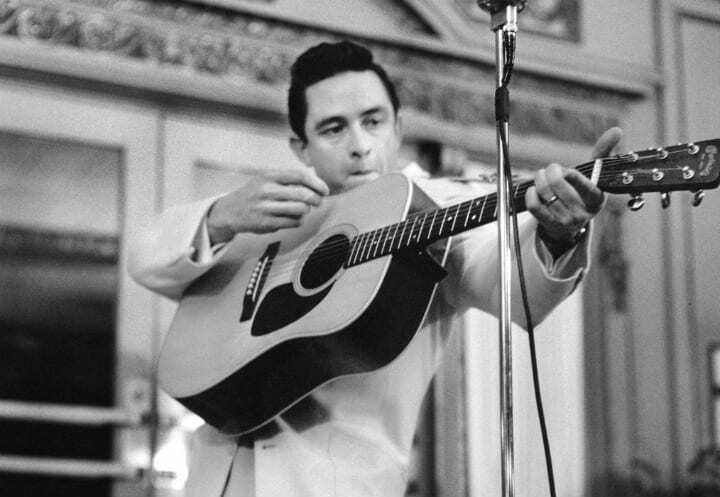 But instead of hanging up his all black outfit and putting away his guitar, Cash had a reaction more in line with the Johnny of his boyhood. After feeling neglect from Columbia Records, his label of roughly 30 years, Cash decided to play the ultimate prank. He released a parody record titled Chicken in Black about his brain being transplanted into a chicken and Cash receiving a transplant of a bank robber’s brain. The song was obviously absurd, but it must have done the trick, because Cash saw his career revived soon thereafter. Perhaps it was a contingency plan in the event that Chicken in Black wouldn’t do what he’d hoped, but Cash would then restart his career in a way that celebrated both his many years in the industry, and the friendships he’d made along the way. 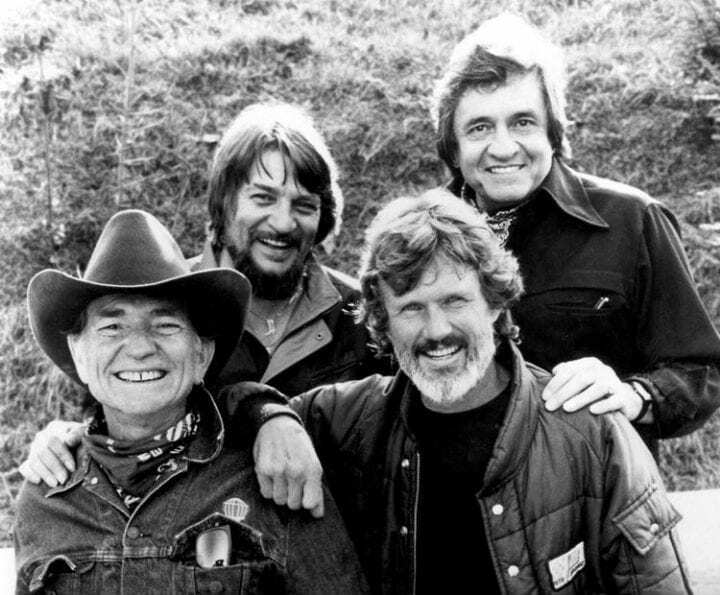 Joining up with fellow musicians and long-time friends Waylon Jennings, Willie Nelson and Kris Kristofferson, the four legends formed the country music supergroup, The Highwaymen. Together they released three albums – all commercial successes. Capitalizing on their success The Highwaymen went on to star in the 1986 remake of the classic western film The Stagecoach. By now, Cash had proven himself to be a double threat, but what about a triple? The undertaking of writing a book is a lot for even the most seasoned writer, but Cash would write not just one, but two autobiographies – each by hand. But at this point you must be saying, not everyone can be good at everything, were they any good? They were! His first autobiography Man In Black was released in 1975 and sold 1.3 million copies, and detailed his life through the height of his career. His second was released years later in 1997 covering his later career and successful marriage to June Carter, thus giving Johnny Cash superfans a firsthand account of nearly his entire career. But his career was far from over. It should be obvious at this point why Johnny Cash is considered by even the biggest country music hater to be the one country singer even they can enjoy. Cash had mass appeal, and if his record sales and sold out concerts were any measure, a huge success. It would only make sense that the industry recognized his contributions to the music world. Johnny Cash is one of only two musicians to have been inducted into the Songwriter’s Hall of Fame (1977), Country Music Hall of Fame (1980), and the Rock and Roll Hall of Fame (1992) with the only other musician being his close friend Hank Williams. But Cash had a major contribution to yet another Country music star’s career. 28. Johnny Cash and Co.
Cash had many famous friends that he met over the years, and they all would vouch for his character as a true blue friend. But that should come as no surprise, that just the kind of guy Johnny Cash was, he had charisma to spare. 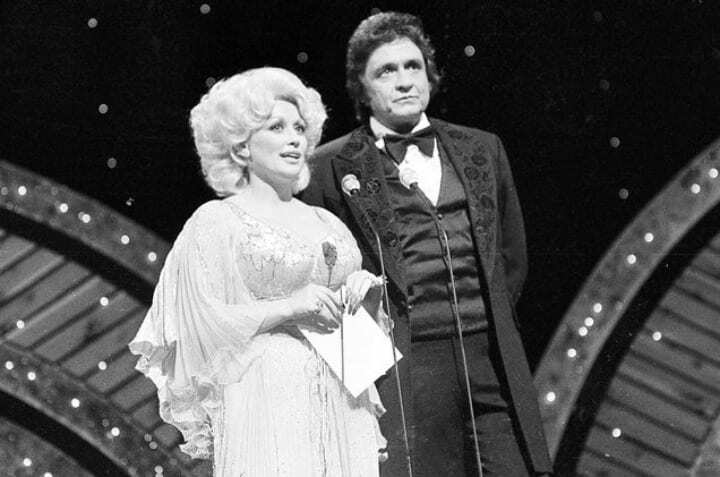 Meeting backstage at the Grand Ol’ Opry, Cash generously coached a nervous Dolly Parton, before her first ever performance on the famed stage. 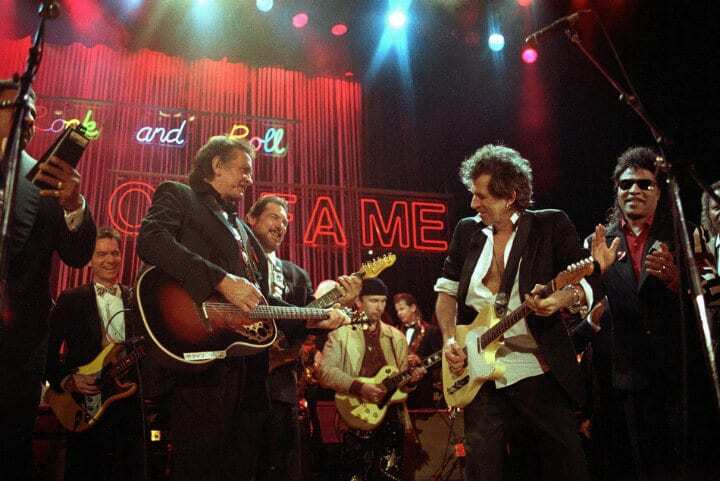 Living legend Bob Dylan, would say about his friend, “In plain terms, Johnny was and is the North Star; you could guide your ship by him – the greatest of the greats then and now.” For one friend in particular, Cash would go above and beyond. 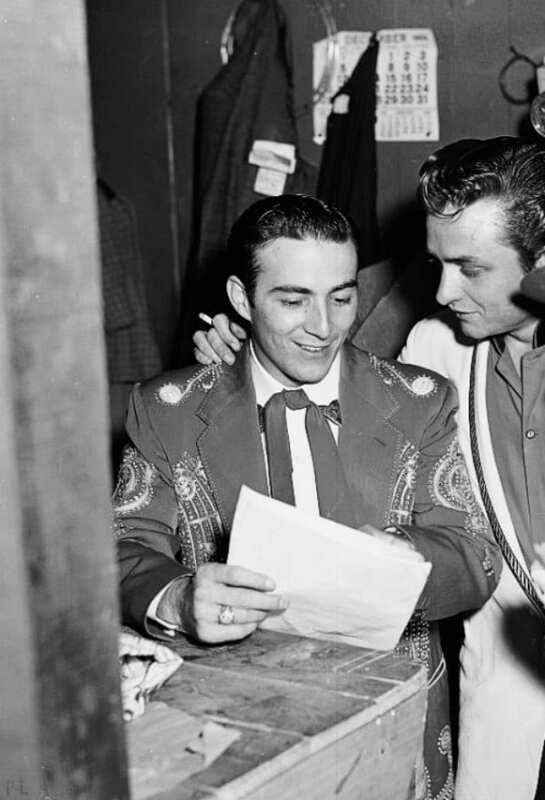 After the untimely passing of “Hillbilly Heartthrob” Faron Young, his family had him cremated, and upon request, his son agreed to give some of his ashes to Johnny Cash and June Carter Cash to spread out in their garden. But it wouldn’t go exactly as planned. An unfortunately timed gust of wind carried the ashes onto the windshield of Cash’s car, but determined to honor his friend as he’d planned, Cash simply turned on his windshield wipers, “…back and forth, back and forth, until he was all gone.” The garden was renamed “The Faron Garden” in honor of his friend. Johnny Cash was a man of honor ’til the very end, as you will soon find out. A consummate performer and musician, Cash would never be ready to retire. Late in his career he’d release covers of songs by some of the biggest bands such as Nine Inch Nails and Soundgarden. But his music had timeless appeal as well. In 1994, Cash re-released his 1962 song Delia’s Gone, with a music video starring 90s It Girl, Kate Moss. 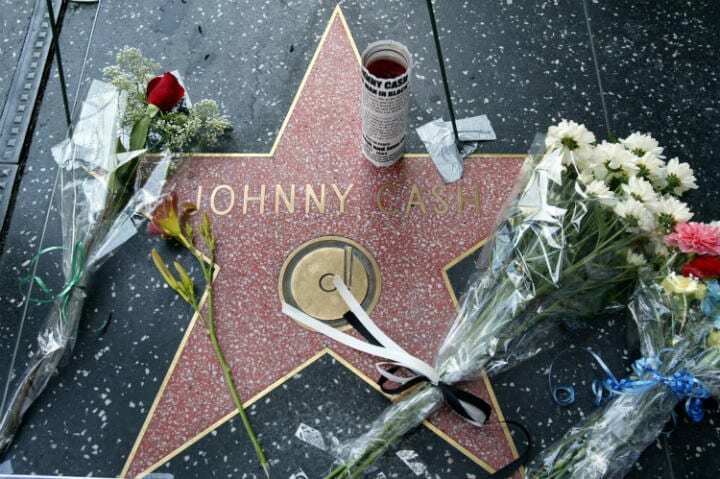 Even after his passing in 2003, the world wouldn’t forget Johnny Cash. Coldplay post-humorously released Till Kingdom Come an intended collaboration, and an Oscar winning film Walk The Line starring Joaquin Phoenix and Reese Witherspoon about his life and love was released. Johnny Cash was a lot of things, but one thing’s for certain, he was an icon and legend never to be forgotten. If we’ve heard it once, we’ve heard it a hundred times in every celebrity interview, A-listers like to date each other because they say it makes it easier if their partner understands the demands of their job. We get it. But just because they were dating within “the biz” doesn’t guarantee that their love was built to last. They may have dated long ago, and a few couples might have even forgotten they were ever in a romance, but we just can’t. We think about that time Cher dated a certain action star at least once a week, and now you will too. There are moments that change your life, and there are moments that make it into the history books. But sometimes, the two are one in the same. Before people were lining up to get a front row seat to some of these celebrities’ movies and concerts, these celebrities had a front row seat to history. For some, witnessing history in the making changed their life paths. For others, the experiences shaped how they saw the world. 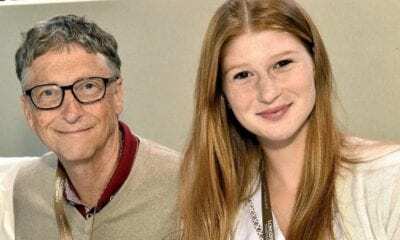 Either way, check out these rarely told celebrity experiences that draw back the curtains on some of your favorite stars, and brush up on your history along the way.